Tumor cell vaccination with irradiated autologous tumor cells is a promising approach to activate tumor-specific T cell responses without the need for tumor Ag identification. However, uptake of dying cells by dendritic cells (DCs) is generally a noninflammatory or tolerizing event to prevent the development of autoreactive immune responses. In this study, we describe the mechanisms that confer the potent T cell priming capacity of a recently identified a population of DCs (merocytic DCs [mcDCs]) that potently primes both CD8+ and CD4+ T cells to cell-associated Ags upon uptake of apoptotic cells. mcDCs acquired cell-associated materials through a process of merocytosis that is defined by the uptake of small particles that are stored in nonacidic compartments for prolonged periods, sustained Ag presentation, and the induction of type I IFN. T cells primed by mcDCs to cell-associated Ags exhibit increased primary expansion, enhanced effector function, and increased memory formation. By using transgenic T cell transfer models and endogenous models, we show that treatment of tumor-bearing mice with mcDCs that have been exposed to dying tumor cells results in tumor suppression and increased host survival through the activation of naive tumor-specific CD8+ T cells as well as the reinvigoration of tumor-specific T cells that had been rendered nonresponsive by the tumor in vivo. The potent capacity of mcDCs to prime both CD4+ and CD8+ T cells to cell-associated Ags under immunosuppressive conditions makes this DC subset an attractive target for tumor therapies as well as interventional strategies for autoimmunity and transplantation. The use of dendritic cells (DCs) loaded with tumor Ags is one of the most promising approaches to induce tumor-specific immune responses (reviewed in Refs. 1–4). The underlying premise of this approach is that the efficiency of, and control over, the vaccination process provided by ex vivo manipulation of DCs can generate an optimally potent APC and a superior method for stimulation of anti-tumor immunity compared with more conventional direct vaccination methods. Although there is a large body of literature on both patient trials and animal models of tumor immunity in which DCs loaded with tumor-associated epitopes/proteins are able to induce immune responses to solid and blood-borne tumors, the efficacy of DC therapy in tumor-bearing hosts is still low. DCs are phenotypically and functionally heterogeneous. Based on surface marker expression, at least six DC populations have been described in mice and humans; plasmacytoid DCs (pDCs), three blood-derived populations (CD4+ DCs, CD8α+ DCs, and CD4−CD8−CD11b+ DCs) (5, 6), and two tissue-derived subsets (Langerhans cells and dermal/interstitial DCs) appear to be distinct sublineages and not precursor product-related (7–9). However, recent research classifying DC populations based on their functional capacities implies the existence of several additional DC populations that are found in common lymphoid tissues or are associated with specific organs (10–13). The potency of the DCs used in therapeutic settings is of critical importance, as the DCs need to activate naive T cells as well as reactivate or reinvigorate tumor-specific T cells that have been rendered anergic by the immune-suppressive environment created by the tumor. Most DC-based tumor therapies require the identification and characterization of tumor Ags for each specific tumor, or, when tumor Ag-derived peptides are used, the appropriate amino acid sequence for each MHC haplotype of the patient (14). The use of apoptotic, autologous tumor cells for DC loading would eliminate the need for Ag identification and present a natural way to target Ags into the MHC pathways of the DC. Most human and mouse DC populations can activate CD4+ and CD8+ T cells when pulsed with cognate peptides. However, although nearly all human and mouse DC populations can capture protein and cell-associated Ags, few populations are able to process and present the Ag-derived epitopes to either CD4+ T or CD8+ T cells (15, 16). In particular, cross-presentation of cell-associated Ags to CD8+ T cells has been thought to be limited to one or two DC populations (16, 17). Besides the fact that only few DC subsets can present both CD4+ and CD8+ T cell epitopes from cell-associated Ags, both human and mouse studies have shown that in vitro and in vivo uptake of apoptotic cells generally induces a tolerogenic state in DCs (18). Phagocytosis of apoptotic material prevents DC maturation and strongly inhibits the production of proinflammatory cytokines (19, 20). Additionally, the uptake of apoptotic cells has been shown to induce immunoregulatory factors that actively dampen adaptive immune responses, including IL-10, TGF-β, PGE2, and IDO (20–23). Although this is crucial for preventing the development of autoreactive immune responses after removal of dying cells during normal tissue homeostasis, tissue repair after injury, and removal of aging and senescent cells, it clearly is an impediment to DC tumor therapy. In this study, we compare the therapeutic capacity of a naturally occurring DC population that lacks the conventional DC subset markers, CD8α, CD11b, and pDC Ag-1 (PDCA-1), and is identified based on its functional capacities. This CD11c+CD11b−CD8α−PDCA-1− DC population represents ∼5% of the splenic DC population and is not susceptible to tolerance induction by apoptotic tumor cells. In contrast, this DC subset produces proinflammatory type I IFNs upon encounter with irradiated or Fas-treated (tumor) cells in vitro (13), and it shows efficient activation of both CD4+ and CD8+ T cells to cell-associated Ag. As this CD11c+CD11b−CD8α−PDCA-1− DC subset only acquired small particles of the dying cells via a process that resembled “nibbling” (13), in contrast to other DCs that engulfed dead and dying cells, we named this subset merocytic DCs (mcDCs; μερoσ = particle). C57BL/6J, B6.PL-Thy1a/CyJ (B6/CD90.1), B6.C-H2bm1/ByJ (Kbm1), and B6.SJL.Ptpcra (B6/CD45.1) mice were purchased from The Jackson Laboratory (Bar Harbor, ME). Ifnar−/−, Kbm1, MHC class I Kb−/−, OT-1/CD45.1, OT-1/CD45.1/Kbm1, and OT-2/CD90.1 actmOVA × Kbm1 transgenic mice (24) were bred in our facility. Mice were maintained under specific pathogen-free conditions in accordance with guidelines by the Association for Assessment and Accreditation of Laboratory Animal Care International. B16F10 (B16) (25), B16F10-OVA (B16-OVA) (25), and B3Z (26) were cultured in IMDM (Invitrogen, Carlsbad, CA) supplemented with 10% FCS, 50 μM 2-ME, 2 mM l-glutamine, 20 U/ml penicillin, and 20 μg/ml streptomycin. OVA257–264 (SIINFEKL), tyrosinase-related protein (TRP)-2180–188 (SVDYDFFDWL), lymphocytic choriomeningitis virus gp33–41 (KAVYNFATC), OVA323–339 (ISQAVHAAHAEINEAGR), and lymphocytic choriomeningitis virus gp61–80 (GLKGPDIYKGVYQFKSVEFD) were obtained from A&A Laboratories (San Diego, CA). DCs were isolated from spleens of naive mice or mice treated for 9 d with 10 μg of human recombinant Flt3L (PeproTech, Rocky Hill, NJ) as described before (27). Data presented in this study were generated with DCs from nontreated naive mice, unless stated otherwise. DCs were subsorted based on their expression of CD11c, CD11b, CD8α, or PDCA-1 by flow cytometry to a purity of >95% and viability >95% (7-aminoactinomycin D [7-AAD] staining). OT-1 and OT-2 T cells were isolated using CD8α or CD4 microbeads (Miltenyi Biotec, Auburn, CA) and labeled with CFSE (Molecular Probes, Eugene, OR) as described before (13). Purity of sorted cells was >98% and viability was >97% as determined by CD4/CD8α/Vα2/Vβ5 expression and 7-AAD staining. DCs were analyzed for the expression of CD4, CD8α, CD11b, CD11c, CD40, CD54, CD80, CD86, Kb, Db, and I-A/E by flow cytometric analysis (Abs/isotype controls; eBioscience/BioLegend, San Diego, CA). For phagocytosis studies, purified DCs were incubated with CFSE-labeled irradiated splenocytes. After 20 h, apoptotic cells were removed and DCs were analyzed either immediately or after an additional 24 h of culture. DCs were stained with Abs to CD11c, CD11b, CD8α, and nuclear dye Draq5 and analyzed by ImageStream (Amnis, Seattle, WA) (28). At least 10,000 events were acquired for each condition. Images of fixed cells were analyzed using ImageStream data exploration and analysis software. The number and size of phagocytosed particles were determined using the spot counting and spot size features after tight masking on the brightfield image to exclude membrane-associated extracellular particles. The measure of phagosomal pH over time was performed as described before (29) in splenic DCs stained with CD11c, CD11b, CD8, and B220. For pH acceleration studies, 10 μM diphenyleneiodium (DPI) was added to the DCs after 1 h of chase, and the pH measurement was performed 15 min later. For ImageStream analysis of lysosomal FITC degradation, purified DCs were stained with CD11c, CD11b, CD8, and B220, incubated with polybeads, and “chased” as described in Savina et al. (29). To calculate the degree of FITC degradation, specific DC populations were selected based on surface markers, after which a spot mask was applied to identify single cells containing only a single bead. For beads, the ratio of FITC/A647 was determined using the “intensity features” that calculates the sum of the pixel intensities in the spot mask with subtraction of the background for each fluorochrome. For Ag retention studies, DCs were incubated with irradiated actmOVA-Kbm1 T cells (1500 rad) in a 1:3 ratio, sorted by flow cytometry after 20 h of coculture, and plated at 1 × 105 cells/well. At indicated time points 1 × 105 OVA257–264-specific B3Z hybrodoma cells were added and their activation was determined 24 h later by chlorophenol red-β-d-galactopyrannoside conversion assay. OVA257–264-pulsed DCs were used as positive control for each population. In parallel studies, DCs were treated with 10 μM DPI for 2 h before B3Z hybrodoma cells were added. To test the capacity for naive T cell priming, 1 × 105 purified DCs were cultured with irradiated actmOVA-Kbm1 T cells in a 1:3 ratio in 96-well U-bottom plates. After 24 h, 1 × 105 CFSE-labeled OT-1 or OT-2 T cells were added to the wells. In this manner, only the DCs are able to present the OVA257–264 peptide to the B3Z/OT-1 T cells, as the mutations in the Kbm1 binding groove do not allow adequate binding of the peptide on the actmOVA-Kbm1 cells (30). Additionally, the lack of I-Ab on the T cells prevents direct activation of the OT-2 T cells. As positive control, DCs were pulsed with OVA peptide for 10 min and thoroughly washed. DC viability over time was determined by annexin V and 7-AAD staining. OT-1 and OT-2 T cell proliferation and survival were determined after 70 h by analysis of CFSE dilution together with staining for Vα2, CD4/CD8α, annexin V, and 7-AAD. Expansion of OT-1/OT-2 T cells was determined by dividing the number of live T cells at the end of the culture by the number of cells added at the start of culture. Cytokine production in the supernatant was determined by standard sandwich ELISA for IL-2, IL-4, TNF-α, and IFN-γ (BioLegend) and reporter assay for type I IFN (13). Intracellular cytokine production was determined in T cells after a 5-h stimulation with cognate peptide in the presence of brefeldin A. Surface staining and intracellular cytokine staining for IFN-γ, IL-2, and TNF-α were performed using a Cytofix/Cytoperm kit (BD Pharmingen, San Diego, CA) according to the manufacturer’s directions. In vitro cytolytic activity was evaluated by a JAM test as previously described (31, 32). B6 mice i.v. received 106 purified DCs that were incubated with irradiated actmOVA-Kbm1 T cells as described above. Apoptotic cells were removed from the DC populations using the apoptotic cell removal kit (Miltenyi Biotec). At indicated time points CD4+ T cell and CD8+ T cell responses were determined by ELISPOT and intracellular cytokine. CD8+ T cell memory was determined upon challenge with 103 OVA-expressing Listeria monocytogenes (13). For the transgenic transfer model, Kbm1 CD45.2 recipients received 1 × 106 CFSE-labeled purified OT-1-Kbm1/CD45.1 cells together with 1 × 106 CFSE-labeled nontransgenic purified CD8+-Kbm1/CD45.2 cells that served as an internal control. The next day mice received i.v. 106 DCs (exposed to irradiated actmOVA-Kbm1 cells). Three days later, OT-1-Kbm1/CD45.1 proliferation and expansion were determined based on CFSE dilution and the ratio of OT-1-Kbm1 to CD45.1 to CFSE control cells. In vivo cytolytic activity was determined as described before (32), using CFSE-labeled B6.CD45.1. and TRP-2180–188 and OVA257–264 peptides. B16-OVA transgenic T cell transfer model. B6/CD45.2 recipients received 1 × 106 tumor cells s.c. in the left flank. As soon as palpable tumor had formed, mice received 106 purified congenically identifiable OT-1 T cells with 106 nontransgenic purified CD8α+ T cells (internal control). At indicated time points mice received i.v. 106 DCs (exposed to apoptotic actmOVA-Kbm1 cells). At different time points tumor-draining lymph nodes were isolated and the ratio of OT-1-CD45.1/CD90.1 control T cells was determined. Activation status of the OT-1 T cells was determined by CD44 staining. Cytokine production by OT-1 T cells was determined by intracellular cytokine staining as described above. Tumor growth was measured every second day with vernier calipers. Tumor size was calculated as the product of bisecting tumor diameters. Mice received 106 B16 cells s.c. in the left flank. As soon as palpable tumors had formed, mice received i.v. DCs (106 cells/mouse) that had been exposed to apoptotic B16 cells. Tumor growth was monitored as described above. Tumor cells and tumor-infiltrating lymphocytes (TILs) were isolated and analyzed as described before (33). Quantitative PCR was performed on resected tumors using SYBR Green and the following primers: mL32, forward, 5′-GAAACTGGCGGAAACCCA-3′, reverse, 5′- GGATCTGGCCCTTGAACCTT-3′; β-actin, forward, 5′-CTGAATGGCCCAGGTCTGA-3′, reverse, 5′- CCCTGGCTGCCTCAACAC-3′; CD8α, forward, 5′-CCGTTGACCCGCTTTCTGT-3′, reverse, 5′-CGGCGTCCATTTTCTTTGGAA-3′; TRP-1, forward, 5′-GCTGCAGGAGCCTTCTTTCTC-3′, reverse, 5′- AAGACGCTGCACTGCTGGTCT-3′ (34). The ratio of CD8α mRNA/TRP-1 mRNA was determined after normalization to β-actin and L32 for each sample (33). Unless stated otherwise, the data are expressed as means ± SEM. Survival responses were analyzed by Kaplan-Meier using a log-rank test. All other data were evaluated using an ANOVA followed by a Dunnett test. A p value of <0.05 was considered statistically significant. Although mcDCs resemble CD8α+ DCs and CD11b+ DCs with regard to MHC class I/II and costimulatory molecule expression (Fig. 1A), they exhibit distinct features after interacting with dying cells. To further characterize the mcDCs, different DC populations were purified from spleens of naive mice, exposed to irradiated CFSE-labeled cells, and analyzed for CFSE uptake by ImageStream, which allows for analysis of high numbers of individual cells with the capacity to discriminate between true and false phagocytosis (intracellular presence versus binding to the surface of cells) (28). mcDCs display a distinct pattern of phagocytosis. A, Surface expression of classical markers on indicated DC populations in the spleen of naive mice (thin line, isotype control; bold line, specific Ab). DCs were sorted based on their presence or absence of the markers CD11c, CD11b, CD8α, and PDCA-1. Data are representative of at least five independent experiments. B, ImageStream panel showing data of uptake of CFSE-labeled cell-associated materials by mcDCs. 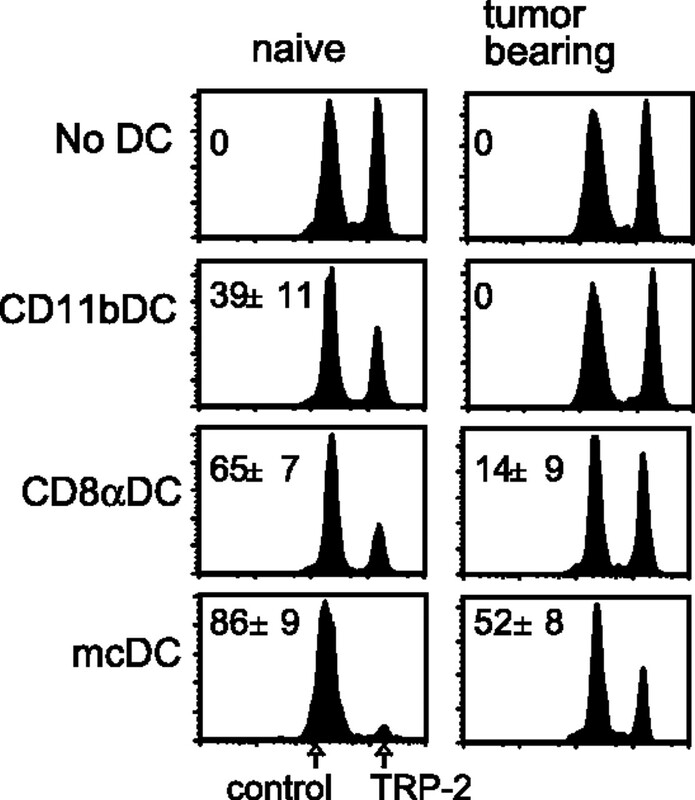 DCs were purified from naive mice and cultured with CFSE-labeled irradiated T cells for 20 h. Subsequently, DCs were stained for CD11c, CD11b, CD8α, and PDCA-1 for analysis. C, Frequency of CFSE-containing cells and number of CFSE particles per cell in indicated DCs. Mask eroding was performed to exclude false phagocytic events (surface-bound CFSE). D, Particle size of internalized CFSE-labeled particles in indicated DCs. Data are representative of four independent experiments. The mcDC population contained a significantly higher frequency of cells with intracellular CFSE-labeled particles compared with the CD11b+ DC population, as well as a slightly increased frequency compared with CD8α+ DCs (Fig. 1B, 1C). Additionally, mcDCs contained more CFSE particles per phagocytosing cell than did CD11b+ or CD8α+ DCs. Importantly, the CFSE particles in mcDCs were considerably smaller than the particles in CD8α+ or CD11b+ DCs (Fig. 1D). Additional studies indicated that the difference in detected CFSE particles was not necessarily reflective of differences in phagocytic capacity, but it could in part be contributed to by different intracellular handling and processing of Ag (35, 36). When pulse-chase experiments were performed, CD11b+ and CD8α+ DCs exhibited quenching of the pH-sensitive dye CFSE over time, indicating transportation of the phagocytosed particles to low pH organelles (Fig. 2A). In contrast, mcDCs showed only a small decrease in both the frequency of cells with phagocytosed material and the number of phagocytosed particles per mcDC over time, suggesting that the phagocytosed material was not subjected to lysosomal degradation. Pulse-chase experiments using beads dually labeled with a pH-sensitive (FITC) and pH-stable (A647) dye demonstrated that 20 h after bead uptake mcDCs retained beads at higher pH than did other DC populations (Fig. 2B, 2C). Comparable results were seen when DCs were analyzed by ImageStream; that is, mcDCs had a significantly increased ratio of FITC to A647 intensity feature (i.e., ratio of the sum of the pixel values within the spot mask, background substracted), indicating the persistence of the FITC signal over time (Fig. 2D, 2E). Ag storage and sustained Ag presentation by mcDCs. A, ImageStream analysis of the frequency of CFSE-containing DCs and the number of CFSE particles per DC 4 h (filled bar) and 16 h (open bar) after removal of irradiated CFSE-labeled cells. Data are representative for four independent experiments. B and C, Lysosomal pH in different phagocytic populations at indicated time points as determined by flow cytometry upon phagocytosis of dual-labeled pH-indicating beads (mean ± SEM; n = 2/group; eight experiments). D, ImageStream analysis of DC populations upon uptake of dual-labeled pH-indicating beads. E, Lysosomal pH in different phagocytic populations at indicated time points as determined by ImageStream (mean ± SEM; n = 150 events/group). F, Activation of OVA257–264–specific B3Z cells by indicated DCs 24, 48, and 72 h after removal of irradiated actmOVA-Kbm1 cells. G, Activation of OVA257–264-specific B3Z cells by indicated DCs directly or 24, 48, and 72 h after pulsing of the DC with OVA257–264 peptide. B3Z data are shown as means ± SEM (n = 3/group; two experiments). H, Effect of DPI treatment on mcDCs. Left panel, Lysosomal pH 30 min after the addition of DPI. Middle panel, Activation of OVA257–264-specific B3Z cells by mcDCs 24 after removal of apoptotic cells. mcDCs were treated for 1 h before B3Z cells were added. Right panel, Activation of B3Z cells by mcDCs that were pulsed 24 h earlier with OVA257–264 and cultured with or without DPI for 6 h. B3Z data are shown as means ± SEM (n = 3/group; two experiments). Importantly, the Ag persistence in mcDCs resulted in a prolonged capacity to prime Ag-specific T cells. mcDCs exposed to irradiated OVA-expressing cells on a Kbm1 background (actmOVA-Kbm1) were able to activate the OVA257–264-specific T cell hybridoma B3Z for at least 3 d after removal of the irradiated cells (Fig. 2F). In contrast, CD8α+ DCs, currently considered the dominant player in the priming of CD8+ T cell responses to cell-associated Ags, showed already a significant reduction in T cell priming capacity 48 h after removal of irradiated cells. This was not a result of decreased DC viability, as peptide-pulsed CD8α+ DCs and mcDCs induced comparable B3Z activation that decreased in time (Fig. 2G and data not shown). Treatment of mcDCs with DPI, a specific inhibitor of flavin-containing enzymes that has been shown to accelerate lysosomal acidification (29, 37), resulted in increased lysosomal acidification in mcDCs that correlated with the loss of their prolonged Ag-presenting capacity of cell-associated OVA to B3Z cells (Fig. 2H). The DPI effect was not mediated by decreased mcDC viability or altered MHC turnover, as DPI treatment did not affect B3Z activation by OVA257–264-pulsed mcDCs (Fig. 2H). To further assess the mcDC capacity for T cell activation, purified DCs were cultured with irradiated T cells from actmOVA-expressing Kbm1 mice. Twenty-four hours later, CFSE-labeled OVA-specific OT-1 or OT-2 T cells were added to the culture. When irradiated T cells from control Kbm1 mice were used, none of the DCs induced activation or proliferation of the OT-1 and OT-2 T cells. After incubation with apoptotic actmOVA-Kbm1 T cells, CD11b+ DCs induced activation of most of the OT-1 and OT-2 T cells, but only a small population of T cells proliferated (Fig. 3A, 3C and data not shown). CD8α+ DCs induced more activation and proliferation in OT-1 and OT-2 T cells than did CD11b+ DCs. However, only mcDCs were able to induce proliferation in all OT-1 and OT-2 T cells (Fig. 3A, 3C). Additionally, both OT-1 and OT-2 cells activated by mcDCs underwent more rounds of division and showed increased accumulation over T cells activated by CD11b+ DCs or CD8α+ DCs. 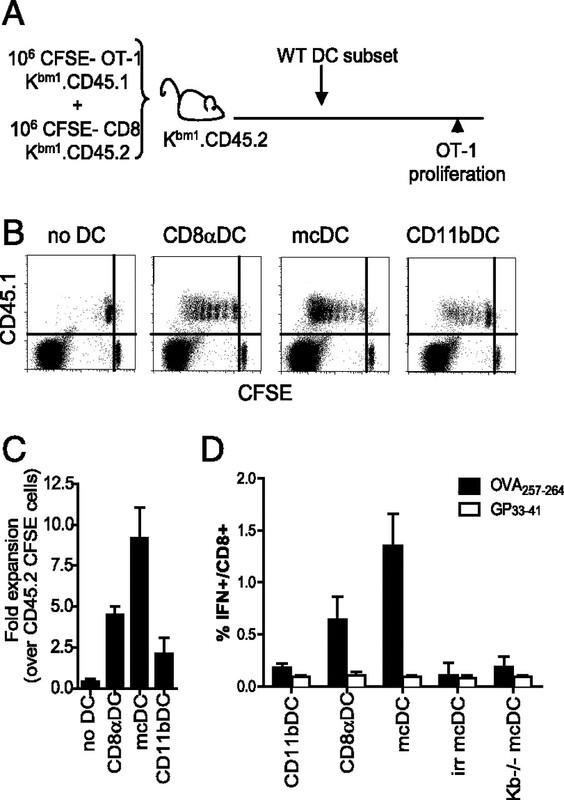 pDCs failed to induce activation and proliferation in OT-1 T cells. When DCs were prepulsed with OVA257–264 or OVA323–339 peptide, all DCs were capable of activating and inducing proliferation in naive OT-1 and OT-2 T cells (Fig. 3A and data not shown). This observation indicated that all DCs were able to prime naive T cells, but that their capacity to do so against cell-associated Ags from apoptotic cells was differently regulated in the distinct DCs. Cell-associated Ag presentation by mcDCs results in increased T cell proliferation and function in vitro. CD11bDC, CD8αDC, mcDC, and pDC were cultured with irradiated Kbm1 or actmOVA-Kbm1 T cells. Twenty-four hours later, DCs were purified and CFSE-labeled CD45.1+ OT-1 or CD90.1+ OT-2 T cells were added and incubated for 70 h. Proliferation of OT-1 (A) and OT-2 (C) T cells as determined by CFSE dilution (gated on CD4/CD8, CD45.1/CD90.1, Vα2+, 7-AAD−). B, Cytolytic activity of OT-1 T cells toward OVA257–264-pulsed EL-4 cells (closed circles) and control-pulsed EL-4 cells (open circles). Background killing was <3% in all groups. D, IFN-γ production by OT-2 T cells upon OVA323–339 peptide stimulation as determined by intracellular cytokine staining. The number in the upper right corner represents the percentage of IFN-γ–producing cells within the OT-2 T cell population. Data are representative of at least three independent experiments. Importantly, most T cells activated by mcDCs were able to produce cytokines upon restimulation with their cognate peptide, whereas only a small fraction of the cells activated by CD11b+ and CD8α+ DCs produced cytokines upon restimulation with peptide (Fig. 3D and Supplemental Fig. 1). Comparable results were found when cytolytic activity was assessed. OT-1 T cells primed by mcDCs showed greater capacity to kill OVA257–264-pulsed target cells at lower E:T ratios than did OT-1 T cells activated by CD11b+ and CD8α+ DCs (Fig. 3B). Comparable results were seen when priming of endogenous CD4+ and CD8+ T cells responses was assessed. 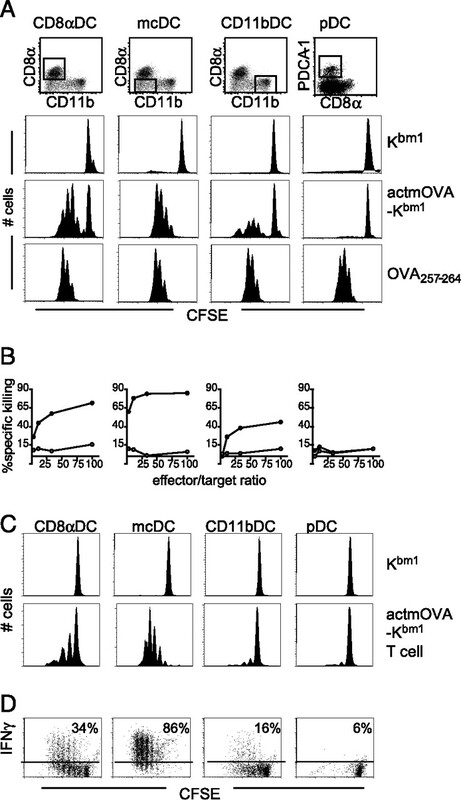 Transfer of mcDCs that had been exposed to apoptotic actmOVA-Kbm1 T cells in vitro induced a higher frequency of OVA323–339-specific IFN-γ–producing CD4+ T cells than did transfer of CD8α+ or CD11b+ DCs (Fig. 4A). Similarly, transfer of actmOVA-Kbm1–exposed mcDCs resulted in an increased frequency of OVA257–264-specific IFN-γ–producing CD8+ T cells compared to transfer of CD8α+ or CD11b+ DCs. OVA257–264-specific CD8+ T cells induced by mcDCs showed comparable kinetics in expansion and contraction as did CD8+ T cells induced by CD8α+ DCs, but they had significantly improved memory expansion when challenged with OVA-expressing L. monocytogenes in vivo (Fig. 4B). Increased proliferation and memory formation by endogenous T cells primed by mcDCs in vivo. CD11b DCs, CD8α DCs, mcDCs, and pDCs were exposed to irradiated actmOVA-Kbm1 T cells, purified, and transferred into WT naive recipients. A, OVA323–339-specific CD4+ T cell responses, as determined by ELISPOT, 10 d after transfer of indicated DCs (filled bars, OVA323–339 peptide; open bars, gp61–80 control peptide). Data from one experiment (out of two) are expressed as means ± SEM (n = 3–4/group). B, Frequency of OVA257–264-specific CD8+ T cell responses as determined by intracellular cytokine staining at indicated time points. Seventy days after DC transfer, mice were challenged with OVA-expressing L. monocytogenes (103 CFU) and frequency OVA257–264-specific CD8+ T cell responses was determined 5 d later. Data are shown as means ± SEM (n = 2–4/group per time point). To determine if T cell priming after mcDC transfer was restricted to the mcDCs or resulted from Ag transfer to other DCs (15), we used an in vivo model in which Ag presentation was restricted to a specific DC population (38). In this model, CFSE-labeled OT-1 CD45.1 cells from Kbm1 mice were transferred together with CFSE-labeled naive CD45.2 Kbm1 control CD8+ T cells into Kbm1 CD45.2 recipients. One day later, purified DCs from wild-type (WT; Kb+/+) mice (exposed to irradiated actmOVA-Kbm1 cells) were transferred into the Kbm1 mice (Fig. 5A). In this model, the transferred DCs are the only cells capable of presenting OVA257–264 to the OT-1 cells, as the Kbm1 recipient mice cannot bind the OVA257–264 peptide sufficiently to allow OT-1 activation via cross-presentation. Comparable to the in vitro data, transfer of Kb+/+mcDCs resulted in increased OT-1 T cell proliferation compared with CD8α+ DC transfer (Fig. 5B, 5C), suggesting that T cell priming resulted from a direct interaction of the T cells with the mcDCs without a need for Ag presentation by other DCs. Similarly, transfer of mcDCs that were either irradiated or lacked MHC class I Kb expression failed to induce endogenous OVA257–264-specific CD8+ T cell responses in WT recipients (Fig. 5D), indicating that mcDCs directly interacted with endogenous CD8+ T cells. mcDCs mediate their effects through direct interaction with Ag-specific T cells. A, C57BL/6-Kbm1/CD45.2+ recipient mice received CFSE-labeled purified OT-1-Kbm1/CD45.1+ cells mixed in a 1:1 ratio with CFSE-labeled, control Kbm1/CD45.2+ CD8+ T cells. Twenty-four hours later, DC subsets that were exposed to irradiated actmOVA-Kbm1 cells were transferred. In this manner, only the transferred DCs can activate the OT-1 T cells, as the mutation in the binding groove of the Kbm1 expressed by host DCs does not allow adequate binding of the OVA257–264 peptide. Three days after DC transfer, the OT-1-Kbm1/CD45.1 responses were analyzed. B, Proliferation of OT-1-Kbm1/CD45.1 as determined by CFSE dilution. Data in dot plots are gated on total CD8+ T cells in the spleen. Dot plots show a representative animal (out of four per group; two independent experiments). C, Expansion of OT-1-Kbm1/CD45.1 T cells in the different groups determined by the ratio of OT-1-Kbm1 to CD45.1+ T cells compared with the internal control (CFSE-labeled C57BL/6-Kbm1/CD45.2+ CD8+ T cells). Data of one experiment (out of two) are shown as means ± SEM (n = 4/group). D, Indicated DCs were cultured with irradiated actmOVA-Kbm1 cells for 20 h, purified, and transferred into naive WT recipients. Irradiated WT mcDCs (1500 rad) and Kb−/− mcDCs were used to alter the degree of direct interaction of the mcDCs with the T cell. Seven days after DC transfer the frequency of endogenous OVA257–264-specific CD8+ T cells was determined by intracellular cytokine staining. Data of one experiment (out of two) are shown as means ± SEM (n = 4/group). All DC populations can produce type I IFNs upon activation with TLR ligands; however, only mcDCs produce type I IFNs after interacting with irradiated cells (Fig. 6A and data not shown). We recently showed that priming of endogenous T cell responses to cell-associated Ags was dependent on type I IFNs (13). We therefore set out to determine the relative contribution of type I IFN production by mcDCs in T cell priming. Transfer of type I IFNR-deficient (ifnar−/−) mcDCs that had been exposed to irradiated actmOVA-Kbm1 cells into WT recipients significantly reduced the induction of endogenous OVA257–264-specific CD8+ T cells compared with transfer of WT mcDCs (Fig. 6B). Additionally, transfer of WT mcDCs into ifnar−/− recipients resulted in a comparable decrease in OVA257–264-specific CD8+ T cell frequency. Transfer of ifnar−/− mcDCs into ifnar−/− recipients resulted in an even more profound decrease in CD8+ T cell responses, illustrating both an autocrine and paracrine role for mcDC-derived type I IFNs in the priming of T cell responses to cell-associated Ags (Fig. 6B, 6C). 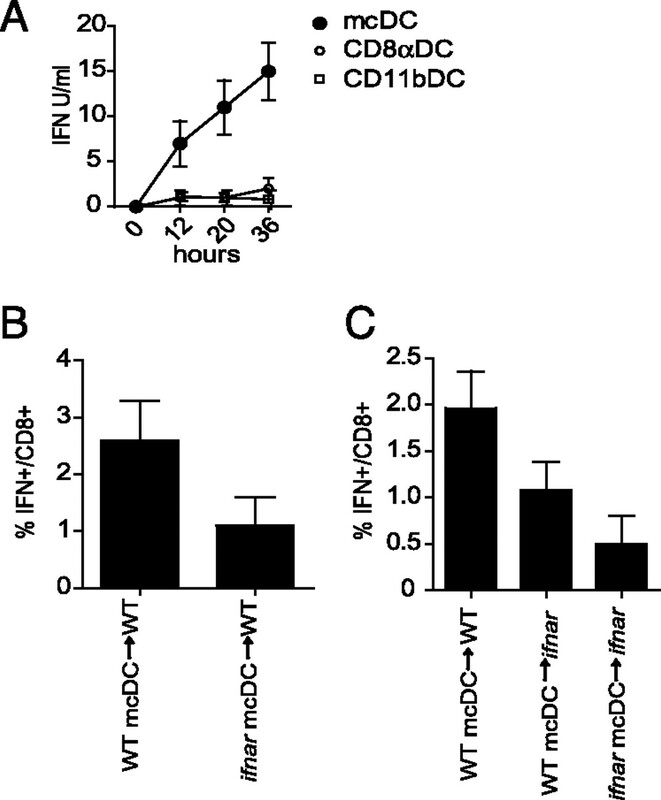 Autocrine and paracrine effects of mcDC derived type I IFN on CD8+ T cell priming. A, Production of type I IFN by indicated DCs upon culture with irradiated cells. B and C, WT or ifnar−/− mcDCs were exposed to irradiated actmOVA-Kbm1 cells, purified, and transferred into WT or ifnar−/− recipients. Seven days later the frequency of OVA257–264-specific CD8+ T cell responses was determined by intracellular cytokine staining. Data of one experiment (out of two) are shown as means ± SEM (n = 4/group). The increased capacity to prime T cells to cell-associated Ags prompted us to study mcDCs in the context of DC tumor therapy. As DC therapy is generally performed after the immune system has been exposed to tumor Ags and the immunosuppressive orchestrations of the tumor, DC therapy not only needs to be able to activate naive tumor-specific T cells, but also to reactivate tumor-specific T cells rendered anergic or nonresponsive by the tumor and/or its environment. To study the efficacy of DC therapy in the reactivation of anergic/nonresponsive tumor-specific T cells we used a model in which B6.PL mice (CD45.2+/CD90.1+) were inoculated with B16-OVA cells and received CD45.1+/CD90.2+ OT-1 T cells (together with CD45.2+/CD90.2+ CD8+ control T cells) as soon as palpable tumors had formed (Fig. 7A). In this model, up to 75% of the OT-1 T cells, but not the control T cells, were actively deleted within 8 d in both the spleen and tumor-draining lymph nodes (Fig. 7B). The remaining OT-1 T cells expressed high levels of the activation marker CD44, but they failed to produce cytokines upon stimulation with peptides in vitro, indicating the induction of nonresponsiveness (Fig. 7C). 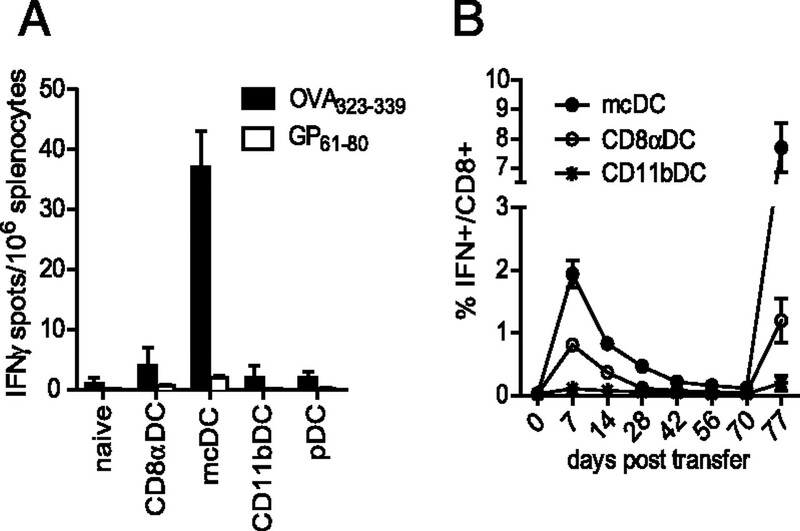 mcDC treatment reinvigorates anergized CD8+ T cell responses in B16-OVA–bearing mice. A, Transfer scheme. Mice (CD90.1/CD45.2) were s.c. inoculated with B16-OVA cells. Four days later mice received 1 × 106 CD45.1/CD90.2 OT-1 T cells mixed in a 1:1 ratio with nontransgenic CD90.2/CD45.2 CD8+ T cells as an internal control. Nine days later mice received 1 × 106 DCs that had been cultured with irradiated actmOVA-Kbm1 splenocytes. B, Ratio of CD45.1 to CD90.2 OT-1 T cells: CD45.2/CD90.2 control CD8+ T cells in time in naive (solid square) and tumor-bearing (open square) mice (without DC transfer). Data are expressed as means ± SEM (n = 4) and are representative of two independent experiments. C, CD44 expression and cytokine production by OT-1 T cells in the spleen 1 and 10 d after transfer into tumor-bearing hosts. Data are shown as OT-1 T cells (CD45.1+) within the total CD8+ population. Numbers in the upper right corner represent the percentage of cytokine-producing cells within the OT-1 T cell population. Data are representative of two independent experiments (n = 3–4/group/experiment). D, Survival of tumor-bearing mice after indicated DC therapy. Mice that survived >80 d showed complete tumor rejection. E, Flow cytometric analysis of OT-1 T cell expansion in the spleen 7 d after DC transfer. Plots show data gated on the total CD8+ T cell population. Numbers under the plots represents the ratio of OT-1 T cells to control CD90.2+ cells (n = 6–8/group). F, IFN-γ and TNF-α production by OT-1 T cells 7 d after DC transfer. Histograms show data gated on the OT-1 population (CD45.1+Vα2+). Numbers in upper right corner represent the percentage of cytokine-producing cells within the OT-1 T cells (n = 6/group). Treatment of tumor-bearing mice 9 d after OT-1 T cell transfer with CD11b+ DCs (exposed to apoptotic actmOVA-Kbm1 cells) did not significantly inhibit tumor growth or increase survival compared with untreated mice (Fig. 7D), nor did it result in an increase in the OT-1 T cell populations in the spleen or tumor-draining lymph nodes compared with untreated mice (Fig. 7E). Treatment with CD8α+ DCs resulted in inhibition of tumor growth, delayed mortality, and tumor clearance in 17–20% of the animals. This protective effect correlated with an increased frequency of OT-1 T cells compared with untreated mice (3.4 ± 1.1-fold increase). Importantly, mcDC treatment resulted in a 12.4 ± 3.8-fold increase in OT-1 T cell numbers concomitant with a significant survival advantage, with 75% of mice being tumor free for at least 80 d after inoculation (Fig. 7D, 7E). Additionally, most of the OT-1 T cells primed by mcDCs produced IFN-γ or IFN-γ/TNF-α after ex vivo stimulation, whereas only few OT-1 T cells primed by CD8α+ DCs produced these cytokines (Fig. 7F). As DC therapy was performed 9 d after OT-1 T cell transfer, when most of the OT-1 T cells had been depleted or rendered anergic/nonresponsive, these data indicate that mcDCs can potently activate protective anti-tumor responses in an otherwise tolerogenic environment. Recent research has suggested that models using transfer of transgenic T cells might not be completely representative of endogenous T cell responses, as endogenous CD8+ T cells are generally present at lower frequencies in naive mice and have a wide range of TCR affinity for the epitopes of tumor-specific and tumor-associated Ags (39, 40). Additionally, the dominant tumor-associated rejection Ags consist of self-Ags (in contrast to the tumor-specific OVA on the B16-mOVA tumor) and the available endogenous T cell repertoire in the periphery and therefore predominantly consist of low-affinity T cells that have escaped selection in the thymus. We therefore tested whether mcDCs were able to induce a protective endogenous CD8+ T cell response to tumor-associated self-Ags. When naive mice were treated with CD11b+ DCs, CD8α+ DCs, or mcDCs that had been exposed to irradiated B16 cells, cytolytic CD8+ T cell responses to the dominant TRP-2 epitope could be seen in an in vivo cytotoxicity assay 7 d later (Fig. 8). mcDC treatment resulted in the most efficient cytolytic response, which correlated with the number of TRP-2–specific CD8+ T cells (Fig. 8 and data not shown). Treatment with CD8α+ or CD11b+ DCs also resulted in significant TRP-2–specific cytolytic responses, but these were not as robust as were those seen after treatment with mcDCs. Importantly, when this experiment was performed in B16 tumor-bearing mice, the TRP-2–specific cytolytic CD8+ T cell responses were significantly reduced. CD11b+ DC treatment did not result in any detectable killing of the TRP-2 targets, while CD8α+ DC treatment resulted in a minimal amount of killing (14 ± 9%). Importantly, mcDC treatment still resulted in considerable killing of the target cells (51 ± 8%) (Fig. 8). As all mice started with a comparable endogenous repertoire and tumor burden, these data indicate that mcDCs were able to activate TRP-2–specific CD8+ T cells under tolerizing conditions, whereas CD11b+ DCs and, to a lesser degree, CD8α+ DCs failed to do so. mcDCs induce cytolytic endogenous responses to tumor-associated Ags in tumor-bearing mice. Mice were s.c. inoculated with B16 cells (tumor-bearing) or left untreated (naive). When palpable tumor had formed in the inoculated mice, mice received 1 × 106 DCs that had been cultured with irradiated B16 cells. One week later mice received a mixture of CD45.1+CFSEhigh TRP-2–pulsed splenocytes and CD45.1+CFSEmed control splenocytes. Specific killing of TRP-2–pulsed splenocytes was determined by flow cytometric analysis 16 h later. Numbers in the plots represent the percentage of specific killing. Data are representative of two independent experiments (n = 4/group). When B16 tumor-bearing mice were treated with TRP-2 peptide–pulsed DCs, no tumor regression/inhibition were observed in any of the treatment groups (data not shown). However, a single treatment with mcDCs that had been exposed to irradiated B16 cells resulted in a significant survival advantage over treatment with CD11b+ or CD8α+ DCs (Fig. 9A and data not shown). Although most mice exhibited only a temporary inhibition of tumor growth, some mice showed complete tumor clearance. Mice that showed complete tumor clearance generally showed depigmentation of the hairs at the tumor site, an indication of a melanin-specific response (Fig. 9B). mcDCs induce protective endogenous CD8+ T cell responses in tumor-bearing mice. C57BL/6 mice were inoculated with B16 cells and, as soon as palpable tumor had formed, mice were treated with indicated DC subsets that had been cultured with apoptotic B16 cells. 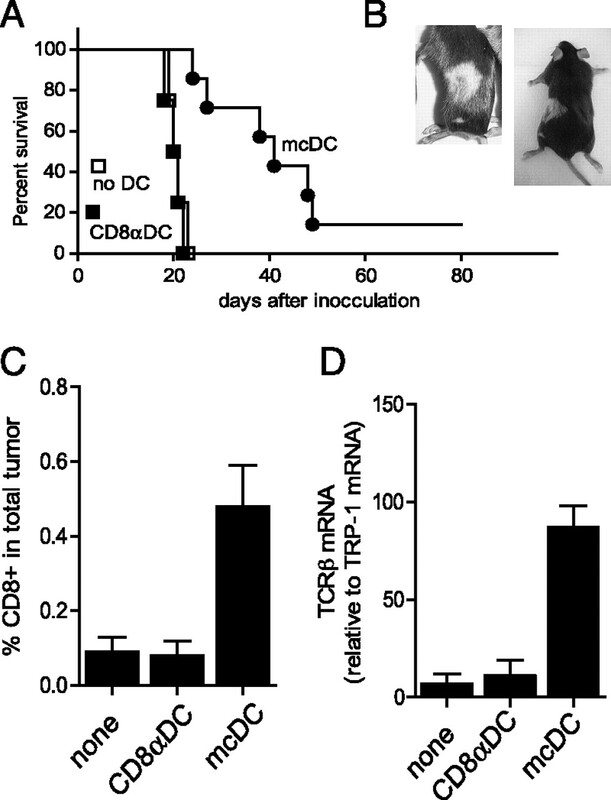 A, Survival of tumor-bearing mice after control therapy (closed square, no DCs), CD8α DC therapy (open square), and mcDC therapy (closed circle). Data are representative of two independent experiments (n = 8–10/group). B, Depigmentation of the inoculated side in mice that cleared the tumor (image taken 60 d after tumor inoculation). C, At the peak of tumor growth (days 18–20) tumors were resected and the frequency of TILs was determined by flow cytometric analysis. D, The ratio of mRNA for TCRβ/tumor Ag TRP-1 in resected tumors. mRNA was extracted from resected tumors, and mRNA for TCRβ and TRP-1 was determined by quantitative real-time PCR. Samples were normalized to L32 and S18 before the ratio was calculated. Data in C and D represent means ± SEM (n = 4–6) and are representative of at least two independent experiments. Analysis of dissected tumors 16 d postinoculation showed a strong correlation of survival advantage with TIL numbers. Tumors from mcDC-treated mice contained a greater frequency and absolute number of CD8+ T cells among the TILs compared with CD8α+ DCs and control-treated mice (Fig. 9C). To obtain a more quantitative assessment of the T cell populations infiltrating the tumor, quantitative RT-PCR was performed and the ratio of TCRβ mRNA to tumor Ag (TRP-1) mRNA was determined (Fig. 9D). No significant difference in the ratio of TCRβ/TRP-1 mRNA was observed between control and CD8α+ DC-treated mice. Corresponding with the flow cytometry data, mcDC treatment significantly increased the ratio of TCRβ/TRP-1 mRNA, demonstrating increased infiltration of TCRβ-expressing cells in the tumor. In this study, we show that a specific DC population with potent capacity to prime both CD4+ and CD8+ T cells to cell-associated Ags can be exploited to induce protective tumor-specific T cell responses in tumor-bearing hosts. mcDCs have a distinct phenotype in the internalization and processing of cell-associated Ags, being characterized by Ag storage in compartments with reduced lysosomal degradation that results in prolonged Ag presentation. mcDC-driven activation of T cells to cell-associated Ags endows T cells with a greater capacity for primary expansion, enhanced effector function, and increased memory development, even in an otherwise immunosuppressive environment. As a result, treatment of tumor-bearing mice with mcDCs was more effective in the induction of protective tumor-specific CD8+ T cell responses, inhibition of tumor growth, and increased survival than was treatment with other types of DCs. DCs are a phenotypically and functionally heterogeneous population of leukocytes and, although the intrinsic properties of each DC subset may dictate their functional specificity, their final maturation and functional capacities are also influenced by the tissue environment and the cell types with which they interact (reviewed in Ref. 41). The mcDCs described in this study account for ∼5% of the total splenic DC population and lack the conventional DC classification markers CD8 and CD11b. Recently, it has been suggested that the CD11b−CD8− DCs that express cystatin C and are expanded by FLT3L are immediate precursors of CD8α+ DCs, as transfer of CD11b−CD8− DCs results in rapid conversion to CD8α+ DCs (10). The mcDCs described in this study share many characteristics with CD11b−CD8− DCs in that they express cysteine protease inhibitor cystatin C and are expanded by FLT3L (data not shown). However, our data indicate that all characteristic features of mcDCs, including type I IFN production after phagocytosis of cell-associated materials, and CD4+ and CD8+ T cell priming to cell-associated Ags, neither required nor affected CD8α expression on mcDCs. Moreover, transfer of mcDCs on a CD45.1 background into a CD45.2 host showed that only a small population of mcDCs expressed CD8α ∼3 d after transfer (Supplemental Fig. 2). Given that CD8α+ DCs do not produce type I IFNs after uptake of cell-associated material and show relatively poor capacity to prime CD4+ T cells to cell-associated Ags, the mcDC population could be regarded as a functionally distinct population. Several mechanisms may contribute to the effective CD8+ T cell priming capacity of the mcDCs, including the distinct internalization, processing, and presentation of Ag, the production of type I IFNs by the mcDCs upon uptake of cell-associated material, and increased induction of CD4+ T cell help. Pulse-chase studies showed that mcDCs were capable of activating T cells to cell-associated Ags over a longer time span than were CD8α+ DCs. Importantly, when DCs were pulsed with the high-affinity CD8+ T cell OVA epitope SIINFEKL, both mcDCs and CD8α+ DCs showed comparable priming, which was significantly less sustained over time than the priming by mcDCs presenting cell-associated Ags. Similarly, transfer of peptide-pulsed mcDCs and CD8α+ DCs into naive mice resulted in comparable CD8+ T cell responses that did not protect mice from subsequent tumor challenge (data not shown). Taken together with the observation that mcDCs “store” cell-associated Ags in a compartment with relatively little lysosomal degradation, these data suggest that mcDCs may use these compartments as a source to continuously supply MHC ligands for presentation. This is in line with the observations of van Montfoort et al. (35), who showed the formation of long-term storage compartments in DCs after receptor-mediated endocytosis of IgG-OVA. These compartments were lysosome-like organelles, distinct from the MHC class II compartment and the recently described early endosomal loading compartments, and they functioned as Ag depots, which enabled the DCs to maintain high MHC peptide levels on their surface over time. Recent studies have indicated that cross-presenting CD8α+ DCs limit endophagocytic proteolysis through low expression and low recruitment of proteolytic enzymes to phagosomes, limited acidification by the vacuolar adenosine triphosphatase, and active alkalinization of the endosomal and phagosomal lumen by NAPDH oxidase 2 (29). In CD8α+ DCs, RAC2-mediated assembly of the NAPDH oxidase 2 complex to phagocomes resulted in the production of reactive oxygen species, which causes alkalinization of the phagosome and prevents Ag degradation (37). mcDCs and CD8α+ DCs have comparable reactive oxygen species production in the resting and activated states (data not shown). Additionally, DNA arrays showed that mcDCs express mRNA for all genes of the NAPDH complex at similar or even higher levels than CD8α+ DCs (data not shown), suggesting that mcDCs could possibly exploit a comparable mechanism as CD8α+ DCs to delay Ag degradation and enhance their Ag-presenting capacity. MHC Ag density and length of T cell stimulation significantly affect clonal burst size, acquisition of effector function, and development of memory (42–46). The sustained Ag presentation by mcDCs therefore could result in a longer, and therefore more robust, activation on a per cell level. Additionally, maintenance of sufficient MHC–peptide complexes on the mcDCs would provide the mcDCs with a greater time frame to encounter and activate T cells. A second adjuvant mechanism in the enhanced priming capacity of mcDCs could be assigned to their production of type I IFNs after uptake of cell-associated materials. Our transfer data show that type I IFNs act in both an autocrine and paracrine fashion, as transfer of ifnar−/− mcDCs into WT recipients, as well as WT mcDCs into ifnar−/− recipients, significantly reduced Ag-specific CD8+ T cell responses. Type I IFNs have been shown to mature DCs and enhance the processing and presentation of antigenic peptides by increasing proteasome components involved in the generation of peptides and components that target the peptides for interaction with MHC class I and class II molecules (47). Additionally, type I IFNs have been shown to enhance MHC expression and soluble and membrane-associated costimulatory molecules that affect T cell priming (48, 49). Besides direct effects on DCs, type I IFNs can act directly on T cells and enhance their proliferation and accumulation by inhibition of apoptosis (50, 51). Additional paracrine effects on bystander cells may result in the induction of cytokines and chemokines that would provide a favorable milieu for T cell priming (49, 52). The ligand that induces type I IFNs in mcDCs after uptake of cell-associated materials is still unknown, but recent research indicates that apoptotic cell-derived nucleotide structures that escape lysosomal degradation can induce type I IFNs (53). Yoshida et al. (54) showed that mice deficient in DNase II, the lysosomal enzyme that digests the chromosomal DNA of apoptotic cells and expelled nuclei, die in feto due to anemia caused by type I IFN production. Mice deficient in both the DNase II and ifnar genes, however, were born relatively healthy. In light of the fact that mcDCs show prolonged Ag retention and delayed lysosomal degradation of cell-associated materials, it is not unlikely that nucleotide structures can escape from such retained material. Our previous work showed that this type I IFN induction was not dependent on TLR signaling (13), which suggests a possible role for cytosolic nucleotide sensors. The capacity of the mcDCs to prime strong CD4+ T cell responses to cell-associated Ags might also be instrumental in the induction of the potent anti-tumor effect. We and others have shown that CD4+ T cell help during priming of CD8+ T cells is required for optimal CD8+ T cell activation, primary expansion, acquisition of effector function, and the development of memory (32, 55, 56). Increasing CD4+ T cell help through transfer of (transgenic) CD4+ T cells or preimmunization of mice has been shown to enhance the induction of CD8+ T cell responses (57, 58). Additionally, ample studies indicate that CD4+ T cell help plays a supporting role in the maintenance, reactivation, and expansion of existing memory cells (59–61). DCs provide an attractive mechanism for therapeutic manipulation of the immune system in the priming of protective anti-tumor responses. However, the complexity of the DC system underscores the necessity for its rational manipulation to achieve protective and therapeutic immunity. Although current therapies with ex vivo-generated DCs have been proven feasible, there are still many obstacles to overcome to improve clinical trial success and offset the cost and complexity of customized cell therapy. In this study, we show that DC therapy using DCs that, after uptake of irradiated tumor cells, exhibit prolonged Ag retention, sustained Ag presentation, production of proinflammatory type I IFNs, and the capacity to prime both CD4+ and CD8+ T cells is efficient in the induction of protective anti-tumor responses in vivo in tumor-bearing hosts. Targeting DCs with these characteristics in humans, or manipulation of other DCs that would induce similar behavior, could be instrumental in the design of effective therapeutic and preventive DC-based cancer vaccines. We thank the core facilities at Cincinnati Children's Hospital Medical Center for their support in animal and cell services. We also thank Drs. Christopher Karp, David Hildeman, Kasper Hoebe, and Jonathan Katz for critical review of the manuscript. This work was supported in part by National Institutes of Health/National Institute of Allergy and Infectious Diseases Grant AI079545 and National Institutes of Health/National Cancer Institute Grant CA138617 (to E.M.J.).
. 2001. Dendritic cells as vectors for therapy. Cell 106: 271–274. 2007. DC-based cancer vaccines. J. Clin. Invest. 117: 1195–1203. 2008. Cancer immunotherapy by dendritic cells. Immunity 29: 372–383.
. 2009. Harnessing dendritic cells to generate cancer vaccines. Ann. N. Y. Acad. Sci. 1174: 88–98.
. 1992. The surface phenotype of dendritic cells purified from mouse thymus and spleen: investigation of the CD8 expression by a subpopulation of dendritic cells. J. Exp. Med. 176: 47–58.
. 1997. The enigmatic plasmacytoid T cells develop into dendritic cells with interleukin (IL)-3 and CD40-ligand. J. Exp. Med. 185: 1101–1111.
. 2002. Developmental kinetics and lifespan of dendritic cells in mouse lymphoid organs. Blood 100: 1734–1741.
. 2002. Mouse plasmacytoid cells: long-lived cells, heterogeneous in surface phenotype and function, that differentiate into CD8+ dendritic cells only after microbial stimulus. J. Exp. Med. 196: 1307–1319.
. 2009. Characterization of an immediate splenic precursor of CD8+ dendritic cells capable of inducing antiviral T cell responses. J. Immunol. 182: 4200–4207.
. 2007. Putative IKDCs are functionally and developmentally similar to natural killer cells, but not to dendritic cells. J. Exp. Med. 204: 2579–2590.
. 2006. Efficient T cell activation via a Toll-interleukin 1 receptor-independent pathway. Immunity 24: 787–799. 1999. The makings of a tumor rejection antigen. Immunity 11: 263–270.
. 2006. Migratory dendritic cells transfer antigen to a lymph node-resident dendritic cell population for efficient CTL priming. Immunity 25: 153–162.
. 2005. 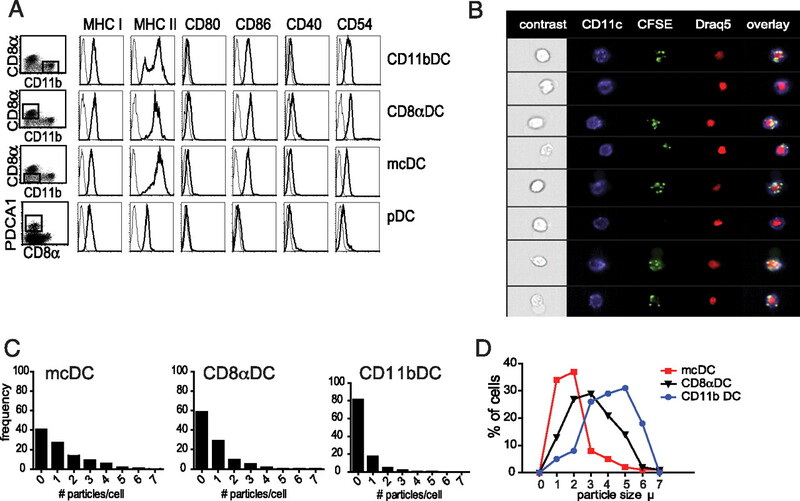 CD8α+ dendritic cells selectively present MHC class I-restricted noncytolytic viral and intracellular bacterial antigens in vivo. J. Immunol. 175: 196–200.
. 2007. Antigen crosspresentation by human plasmacytoid dendritic cells. Immunity 27: 481–492.
. 2006. Dendritic cell and macrophage subsets in the handling of dying cells. Immunobiology 211: 567–575.
. 2006. Phagocytosis of apoptotic cells and immune regulation. Scand. J. Immunol. 64: 1–9.
. 2007. Mediators involved in the immunomodulatory effects of apoptotic cells. Transplantation 84(1, Suppl)S31–S34.
. 2005. Signals from dying cells: tolerance induction by the dendritic cell. Immunol. Res. 32: 99–108.
. 2007. Peripheral CD8 T-cell responses to apoptotic cell proteins and peptides. Crit. Rev. Immunol. 27: 357–365.
. 2008. 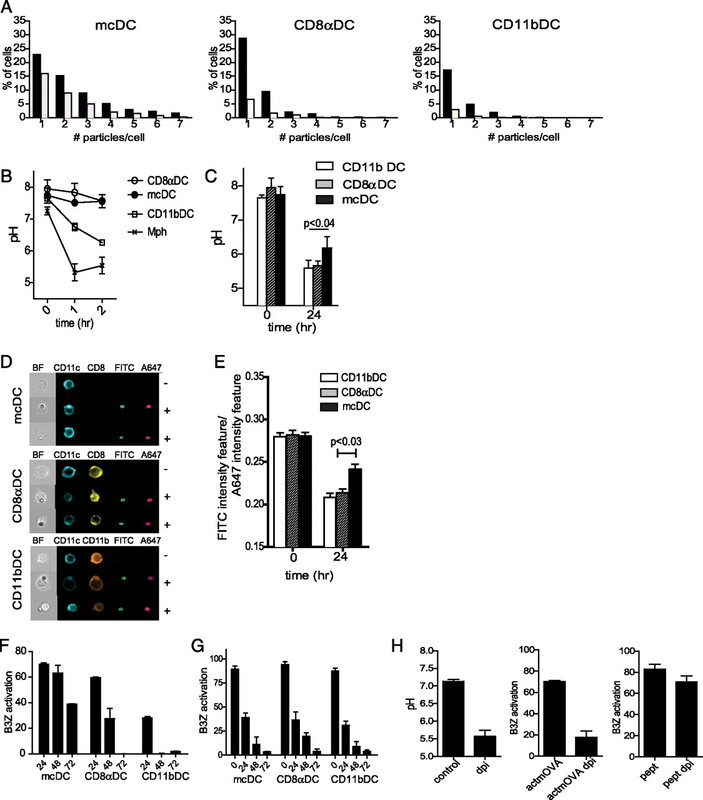 Apoptotic cells induce dendritic cell-mediated suppression via interferon-γ-induced IDO. Immunology 124: 89–101.
. 2003. Development of a novel transgenic mouse for the study of interactions between CD4 and CD8 T cells during graft rejection. Am. J. Transplant. 3: 1355–1362.
. 2000. Relevance of the tumor antigen in the validation of three vaccination strategies for melanoma. J. Immunol. 165: 2651–2656.
. 1994. LacZ inducible, antigen/MHC-specific T cell hybrids. Int. Immunol. 6: 369–376.
. 1997. Dramatic numerical increase of functionally mature dendritic cells in FLT3 ligand-treated mice. Adv. Exp. Med. Biol. 417: 33–40.
. 2007. The ImageStream system: a key step to a new era in imaging. Folia Histochem. Cytobiol. 45: 279–290.
. 2006. NOX2 controls phagosomal pH to regulate antigen processing during crosspresentation by dendritic cells. Cell 126: 205–218.
. 1990. The effect of mutations in the MHC class I peptide binding groove on the cytotoxic T lymphocyte recognition of the Kb-restricted ovalbumin determinant. Eur. J. Immunol. 20: 2431–2437. 1991. The JAM test: a simple assay for DNA fragmentation and cell death. J. Immunol. Methods 145: 185–192.
. 2003. CD4+ T cells are required for secondary expansion and memory in CD8+ T lymphocytes. Nature 421: 852–856.
. 2006. Cell-associated double-stranded RNA enhances antitumor activity through the production of type I IFN. J. Immunol. 177: 6122–6128.
. 1989. Human tumor infiltrating lymphocytes: analysis of lymphokine mRNA expression and relevance to cancer immunotherapy. J. Immunol. 142: 4520–4526.
. 2009. Antigen storage compartments in mature dendritic cells facilitate prolonged cytotoxic T lymphocyte cross-priming capacity. Proc. Natl. Acad. Sci. USA 106: 6730–6735.
. 2009. The small GTPase Rac2 controls phagosomal alkalinization and antigen crosspresentation selectively in CD8+ dendritic cells. Immunity 30: 544–555.
. 2008. Dendritic cell programming by cytomegalovirus stunts naive T cell responses via the PD-L1/PD-1 pathway. J. Immunol. 180: 4836–4847.
. 2007. Initial T cell receptor transgenic cell precursor frequency dictates critical aspects of the CD8+ T cell response to infection. Immunity 26: 827–841.
. 2005. Initial T cell frequency dictates memory CD8+ T cell lineage commitment. Nat. Immunol. 6: 793–799.
. 2007. Development of dendritic-cell lineages. Immunity 26: 741–750.
. 2003. Dynamic programming of CD8+ T lymphocyte responses. Nat. Immunol. 4: 361–365.
. 2001. Naïve CTLs require a single brief period of antigenic stimulation for clonal expansion and differentiation. Nat. Immunol. 2: 423–429.
. 2006. Duration of CTL activation regulates IL-2 production required for autonomous clonal expansion. Eur. J. Immunol. 36: 1707–1717.
. 2001. Memory CD8+ T cell differentiation: initial antigen encounter triggers a developmental program in naive cells. Nat. Immunol. 2: 415–422.
. 1998. The duration of antigenic stimulation determines the fate of naive and effector T cells. Immunity 8: 89–95.
. 2003. Upregulation of costimulatory molecules induced by lipopolysaccharide and double-stranded RNA occurs by Trif-dependent and Trif-independent pathways. Nat. Immunol. 4: 1223–1229.
. 2008. Type I interferon as a stimulus for cross-priming. Cytokine Growth Factor Rev. 19: 33–40.
. 1999. Type I interferons keep activated T cells alive. J. Exp. Med. 189: 521–530.
. 2006. Direct stimulation of T cells by type I IFN enhances the CD8+ T cell response during cross-priming. J. Immunol. 176: 4682–4689.
. 2002. Requirement of the IFN-α/β-induced CXCR3 chemokine signalling for CD8+ T cell activation. Genes Cells 7: 309–320.
. 2005. Toll-like receptor-independent gene induction program activated by mammalian DNA escaped from apoptotic DNA degradation. J. Exp. Med. 202: 1333–1339.
. 2005. Lethal anemia caused by interferon-β produced in mouse embryos carrying undigested DNA. Nat. Immunol. 6: 49–56.
. 2003. Defective CD8 T cell memory following acute infection without CD4 T cell help. Science 300: 339–342.
. 2003. Requirement for CD4 T cell help in generating functional CD8 T cell memory. Science 300: 337–339.
. 2005. Cutting edge: TLR ligands are not sufficient to break cross-tolerance to self-antigens. J. Immunol. 174: 1159–1163.
. 2007. Memory CD4 T cells enhance primary CD8 T-cell responses. Infect. Immun. 75: 3556–3560.
. 2009. Cognate CD4 help is essential for the reactivation and expansion of CD8 memory T cells directed against the hematopoietic cell-specific dominant minor histocompatibility antigen, H60. Blood 113: 4273–4280.
. 2007. CD4 T cells are required for CD8 T cell survival during both primary and memory recall responses. J. Immunol. 179: 8243–8251.
. 2004. CD4+ T cells are required for the maintenance, not programming, of memory CD8+ T cells after acute infection. Nat. Immunol. 5: 927–933.